Jeff Peters: I knew it! One minute with a woman and he short circuits. 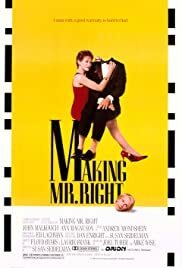 After he is seen with a beauty queen, Florida advertising executive Ann Magnusson (as Frankie Stone) drops "not hard enough" politician boyfriend Ben Masters (as Steve Marcus) from her roster. Next, she accepts a pitch from the local "Chemtec" organization; in danger of losing their government funding, the company wants Ms. Magnusson to work on public relations. She meets the company's chief calling card, an anatomically correct blond android named "Ulysses" (played by John Malkovich). He's the spitting image of creator "Jeff Peters" (Mr. Malkovich again). His "Dr. Frankenstein" wants "Ulysses" to be a spaceman, but the android gets lovesick for Magnusson, and wants to remain on Earth. This dilemma makes you wonder why they didn't leave a trio of parts off the manly Malkovich; probably, it was due to his creator not being very "good with people." It all works out just fine in the end. The cast is fun, if not always funny. And some of the supporting characters are cast aside by a quick ending. Still, Malkovich makes a great date; especially, watch for his hilarious encounter with Laurie Metcalf (as Sandy) at the mall.